Current conditions indexes in the ZEW framework usually do not change by much month-to-month. That was the case this month as well. But there was substantial degradation in expectations. Fears surrounding the possibility of a trade war are running high especially for Europe where international trade is so important. Viewed anther way, Europe trades intensely with itself but EMU trade dependence vs. the rest of the world is not much different from that of the United States. Still, Europe feels that trade is a policy touchstone. Inflation expectations by the ZEW experts are little changed on the month while interest rate expectations continue to push higher. What is going on here? What is this strange new land of ZEW with much reduced expectations yet with everything else more or less the same...forever? The story this month revolves around economic expectations that have soured sharply. The average index point drop on the month for the six countries surveyed is a decline of over 8 points while the average queue percentile standing month-to-month drops by 9.1 percentile points. That is quite significant since the average queue standing for this month is in only its 23.2 percentile among the various respondents. These are now very poor standings for the outlook. The German expectation fell to -8.2 in April from 5.1 in March as the U.S. standing fell to -3.3 from 11.7. These are the only two readings that crossed over from a net positive reading to a net negative reading. However, both the U.K. and Italy log net negative readings in April; but for the U.K. the reading actually improved while the Italian index deteriorated. While still positive, the French index plunged by 14.3 points on the month, second only to the U.S. that experienced a downdraft of 15 points and a bit worse than the German index that skidded to a 13.3 point loss. Trade-war fears have hit EMU members hard. The ZEW financial experts obviously take the new environment as being more risky. They have made cuts in the outlook (expectations) more or less across the board after having made steep cuts in the outlook one month ago. Although no one is talking about recession, based on the deterioration in this survey and slippage in a few other indicators, were a recession to start soon, historians would look back and say that it was well-telegraphed. The Markit PMI gauges have been slipping for Europe although they still plainly point to ongoing growth. Asian PMIs never did get back on a strong growth track in the recovery period. China’s first quarter GDP was juts reported and it rose by 1.4%, a bit short of the 1.5% expected and slower than the 1.6% logged in the fourth quarter of last year. We are waiting to see how much degradation there is in the U.S. PMIs this cycle. The early Empire State regional Fed MFG survey was slightly weaker in April but with a collapse in its outlook index. In addition, despite oncoming tax cuts, the U.S. consumer has not stepped up spending. U.S. retail sales continue to disappoint. There are definitely straws in the wind of a slowdown of some sort. And there seems to be something real in the mix, not just some vague future fear that may not pan out. A good deal of it probably links to trade concerns but not all of it. Despite the sharp downgrade in ZEW expectations, the same group of financial experts cannot bring itself to gore its own ox. The ZEW financial experts’ stock market outlook is barely affected despite the extreme drop in macroeconomic expectations! 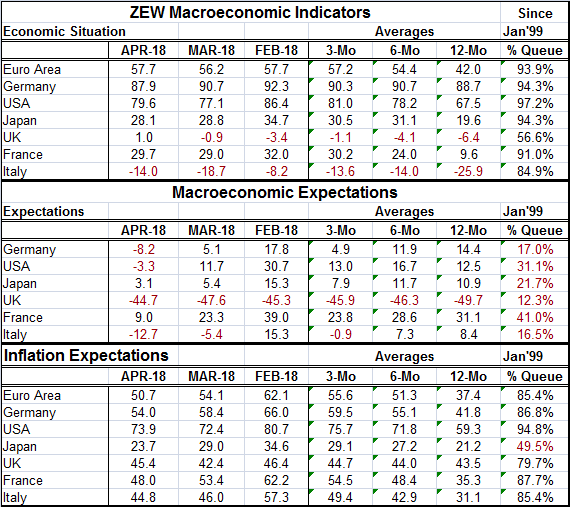 ZEW experts continue to see rate hikes and more of them. So is there real risk or is there business as usual? Can we really have both? If I had to classify this set of forecast from the ZEW experts, I would call it ‘denial.’ The experts seem to want to communicate that there is, not just some risk, but great risk out there. Yet, at the same time, they want to deny that it will be experienced. They see in some sense the economy firming and central banks raising interest rates further. They see long- and short-term interest rates going up. They generally do not see much more inflation than they did one month ago. And despite the sharp drop in macroeconomic expectations, central banks stay on course for rate hikes. This is an odd constellation of events. The ZEW experts seem unwilling to depart from their past financial forecasts despite the risks that have impressed them to cut their expectations and to cut them sharply. This is not an impossible scenario; it is just a bit inconsistent and unlikely. I think the ZEW experts are having trouble revising their past forecasts and reconciling them with new fears. This is not surprising since the IMF has just come out with a new forecast of 3.9% for world growth this year, the best outlook since 2011. Still, reality is out there somewhere. Perhaps it lives between this new more buoyant forecast by the IMF and the deepest fears of the ZEW experts. But there is no denying that we seem to live in a bifurcated world and that economic contradictions are becoming commonplace.